At Artful Dogs we believe that each pet is special and unique. Our commissioned portraits attempt to capture the individuality and personality of your pet. All portraits are custom pieces painted from photos supplied by the customer. Portraits vary in price according to size and number of animals represented. Visit our gallery of pet portraits to see some of our portraits in watercolor, acrylic, or pastel. 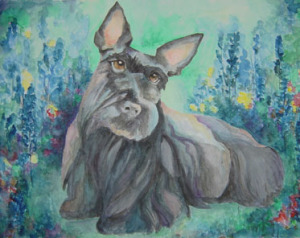 While our focus historically has been dogs, we are pleased to fulfill requests for paintings of any animal. We also paint portraits of houses. All portraits are custom pieces painted from photos supplied by the customer. Portraits vary in price according to size and number of animals represented. Please refer to the schedule below for pricing. All prices are in U.S. dollars. Prices do not include mats, shipping, or Maryland sales tax. Most orders are sent via U.S. Mail, professionally packaged and insured. Fed Ex deliveries are also available. A 50% non-refundable deposit is required in order to commission a portrait. We do not accept credit cards, but a check or money order is welcome. We will contact you when the portrait is complete. The artwork will be shipped when we receive full payment. If the outstanding balance is not paid within 90 days of completion, the portrait becomes the property of Artful Dogs. All photos will be returned. To commission a portrait, email us and provide your name, address and phone number; the type and number of pets and their names; and the type of portrait desired. For your convenience you may also email photos of your pet. If you prefer to mail them, send the photos and a deposit to: Artful Dogs, 614 Burnside Street, Annapolis, MD 21403. Please allow at least four weeks for a watercolor or pastel, and six weeks for an acrylic portrait; shipping time not included. Rush orders add 15%. Please note, while we attempt to address all stylistic requests, the final portrait composition is at the discretion of the artist.